In my post outlining the various era of steel pen history I name the first two as Prehistory and The Craft Era. In this post I’ll dispose of the first, and show how the second period, the Craft Era, lays the groundwork for the real explosion in pen production during the Early Years. There are several key sources which have gathered together multiple references in past documents, letters, etc… that mention early example of metallic pens. The most exhaustive I’ve found is the slim volume The Story of the Invention of Steel Pens by Henry Bore, Ivison, Blakeman and Co., New York, 1890. This wonderful booklet of 60 pages packs more history per page than many other works of that more verbose time. In pages 3 ’till about 15 (when he strays fully into the next era), Mr. Bore lists citation after citation of references to earlier metallic pens. Basically, what these references all add up to is a picture of various people at various times imitating a writing pen, usually in a precious metal as a special one-off product. These seem to have been some variation of a barrel pen. Imagine a flat sheet of metal rolled into a tube and a pen point cut out of one end. This tube is mounted on a stick of some sort (wood, metal, whatever), and that is a barrel pen. These seem to usually be for nobility or special people like scientists or writers. These were specially created works from artists or craftsman. Where we start to see a transition is in the often-quoted story told by Josiah Mason who credits his mentor Harrison, with making a steel pen for the famous chemist Dr. Joseph Priestly (discovered oxygen, etc…) in the late 1780’s. This becomes a transition because this same Josiah Mason, in the 1820’s becomes one of the small group of major British men who turned one-off artisan pens into a valid industry, churning out high-quality pens using machines and mass-production methods. But that’s getting ahead of ourselves a little. What we start to see around 1780 are a few people experimenting with making steel pens as a possible livelihood. You have Harrison mentioned above. His technique was to roll a sheet of thin steel into a tube. The seam where the two side met he used as the slit, and then filed away the underside to make the shape of a pen. This was a highly laborious process. There were others, such as a blacksmith named Fellows, of Sedgley (England) who in 1796 punched the shape out of a sheet of steel, wrapped the end into a tube and cut the slit with a chisel. Slight easier than Harrison, but still not fast enough. These first steel pens were not only difficult to make, but users complained that they were stiff and scratchy. The steel was easily eaten away by the corrosive ink of the day. But it was the stiffness that really seemed to be a problem. Quills can be flexible or they can be stiff. Swan quills, in particular, are big and thick and were known for stiffness. This was good for some kinds of writing, but much of the writing that was popular by the end of the 18th-century required a fine-point and a flexible tip. Someone needed to find a way to increase the flexibility of these early steel nibs before they could move from being a novelty to become a true commodity. Despite the shortcomings, people were beginning to make and buy these early steel pens, primarily, it seems, in England. In 1806 Collins, Perkins & Co, a stationer in New York City, advertises that he has just received a shipment from London which includes “a large supply of steel pens.” Someone over there was making them and even exporting them. Could this have been Harrison? Fellows? Fellows’ former assistant Sheldon? Could it have been Wise of London with his “Elastic Steel Pens,” another barrel pen he began making in 1803? Here’s an 1807 ad for Wise’s pens. Remember that spelling back then was more of a competitive sport than the set of standards it eventually became. Right around this time, we find our first American pen maker, Peregrine Williamson. The story goes that in 1800 Williamson was a jeweler in Baltimore. He was having trouble mending his quill pens (this was a common problem, quills wore out quickly and most people were not very good at mending their quills), so, being a jeweler, he made himself a pen from steel instead. The first ones were too stiff, like the others being made at the time. Part of this was the thickness of the steel, but also the form of the barrel pen did not led itself to great flexibility. He decided to make a few adjustments and thereby seems to be the first to add slits to each shoulder of the pen. (an innovation later claimed by the British, a claim unchallenged until now) This moved the focus of the tines’ flex further back on the pen and thus increased the flexibility of the tines. This became his Elastic Three Slit Metallic Pen. By 1808 he had moved to New York and set up a business making quite a good living for both himself and an assistant just making these improved steel pens. According to an article in the Boston Mechanic magazine for August, 1835, Peregrine Williamson was clearly a profit of $600/month with the work of himself and his assistant. He did sell his pens for 100-cents each, so they weren’t cheap. In 1814 that would be about $260,000 a month in today’s dollars in profit. Not bad. In 1809 Williamson took out his most ambitious ad to date. It is also one of, if not the first, example of a President of the United States being quoted in an advertisement. You can also see from the illustrations that these are also barrel pens affixed to a handle. The “uniformity of their books” mentioned as an advantage of the steel pen over the quill comes from the fact that quill pens, especially if they are not mended by a professional, can vary quite extensively. This can lead to one pen writing broad, one fine, and thus an inconsistent look to your journals and accounts. An interesting follow up to this story with President Jefferson is that in a letter of 1822, Jefferson is writing to his friend DeWitt Clinton in New York. This indicates that Clinton had sent him most likely a gold pen, or at least one not made of steel, and that the former President had had trouble with the ink of the time corroding his steel pens too quickly. By 1812 you no longer see ads for British steel pens as we were having a bit of a tiff with the island nation and goods were slow in getting here. 1813 ad for a whole host of stationery and fancy goods items, only mentions Williamson’s pens. But later in the teens, Sheldon, the assistant of Fellows who had made barrel pens back in 1795 in Sedgley, began making his Sheldon’s Inimitable Elastic Semi Lunar Steel Pen. You also still had stationers advertising Williamson and Wise as the only named pens. 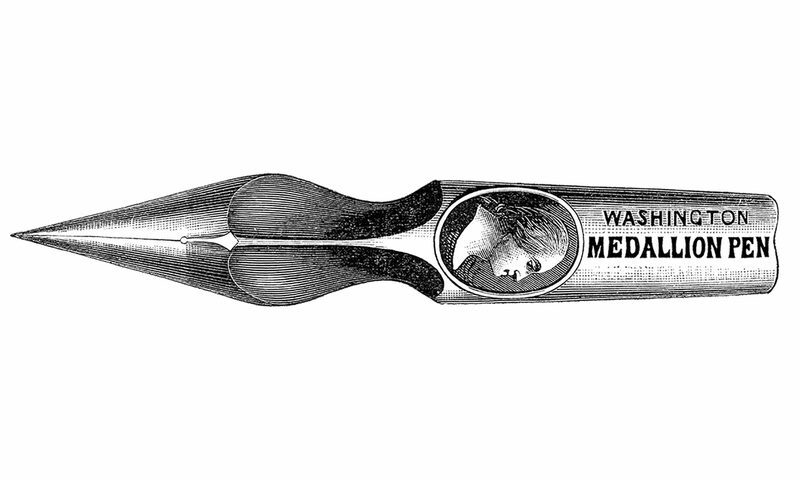 Various other mentions during this period in American advertisements shows that steel pens were becoming a standard item, even as quills were still the norm. Quills were still the primary writing instrument, though. In an 1820 advertisement for a Penmanship class, one of the skills being taught is “to make a good pen” i.e. cut a quill to make a good pen with which to write your new penmanship. To this point in its history, the steel pens made by the above gentlemen were actually still pretty much hand-made objects. But the foundations are being laid for the true revolution in the pen industry which occurs in the next decade. From 1820 to 1830 we see the introduction of machinery and eventually mass-production methods used to make steel pens, and they go from a luxury item to an everyday tool of the student, businessman and common writer.